It’s been a busy month for me, hence the lack of updating, so I’m going to try to catch up with a few things on here. Firstly, I’ve been cast in a production of Shakespeare’s Merchant of Venice as the character, Launcelot Gobbo. Additionally, one of the plays I wrote was accepted into the 4th Lionface Winter One Acts, so it will be performed through Lionface at the annual showcase. I’m excited to see what people do with my script! I’ve recently moved out of my apartment and into a new one, so I will be spending another year in Bowling Green. 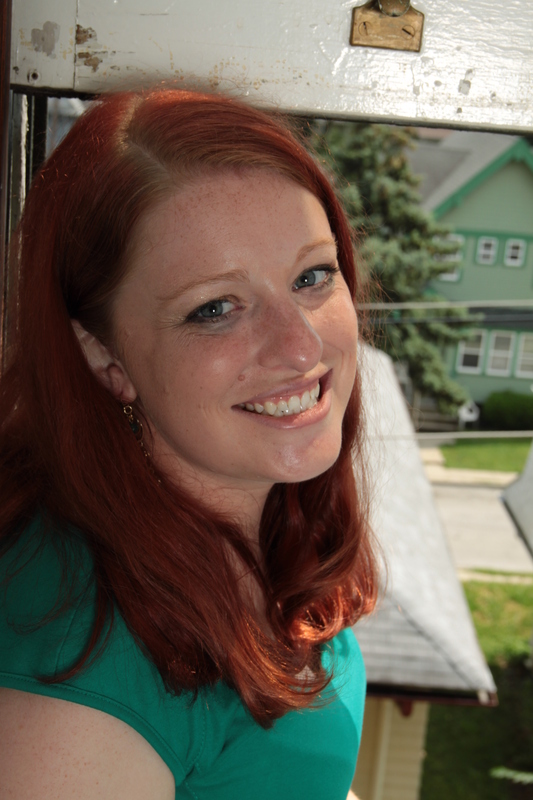 I have quit my job waitressing, but will be returning to Cedar Point as a Screamster in this years Halloweekends. More on that as it gets closer. Chula is doing wonderfully, her adult fur is coming in a lot darker, so her tail is almost black now. 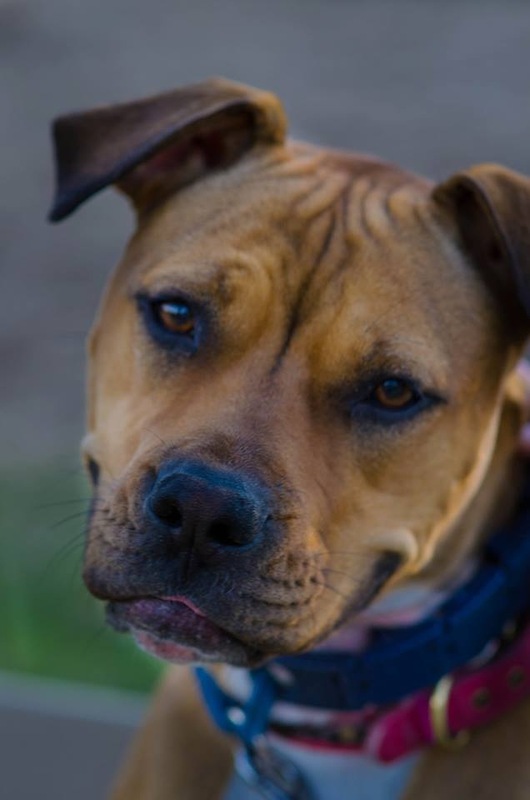 She also won “Best in Class” at her doggy obedience class and was described as being “the happiest dog” at a local doggy day care. Her growth has been amazing and I couldn’t be more proud! 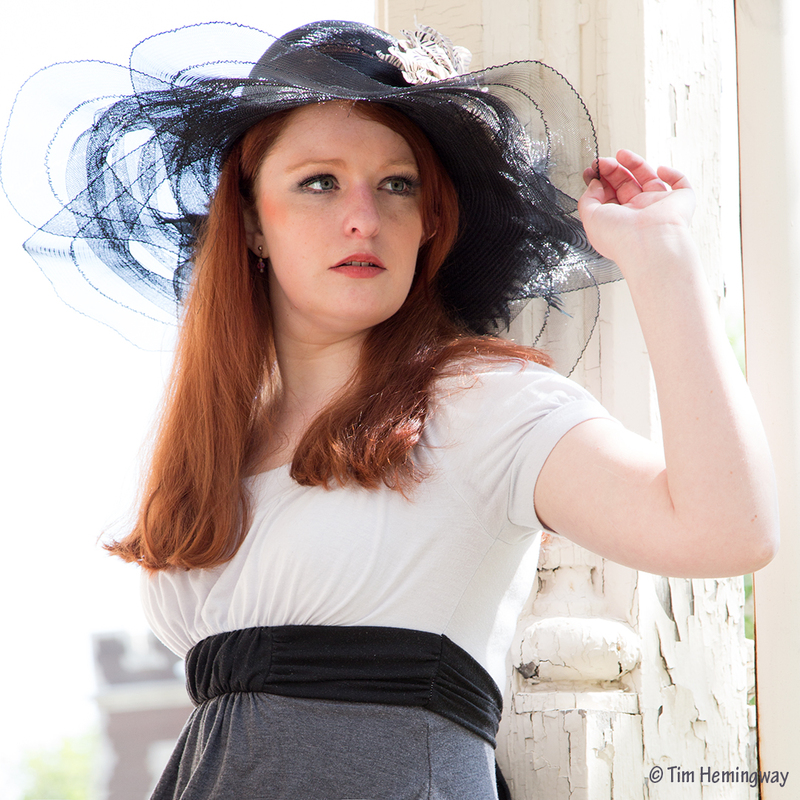 Within the past month, I’ve started doing some more modeling and I have been really enjoying it. I will most likely add more of the photos to my website eventually, but for now I will post a couple of the more popular ones here. 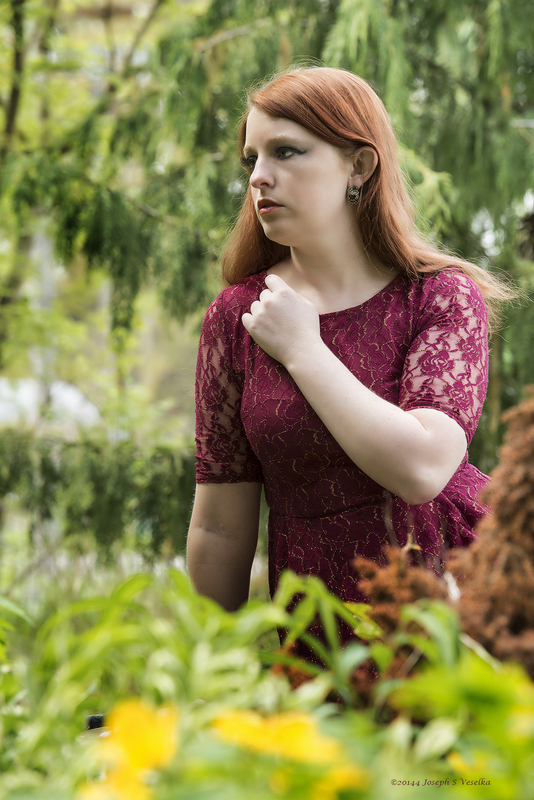 These photos were all taken at a group shoot in Toledo, Ohio, where I had a great time and made a lot of great connections. I am hoping to create more art with some of these talented people soon, but my schedule has been hectic. So that’s it for now, now you are caught up on my life a bit. Hello again, long time, no post. My bad. Let’s see how long it takes for me to play catch up! 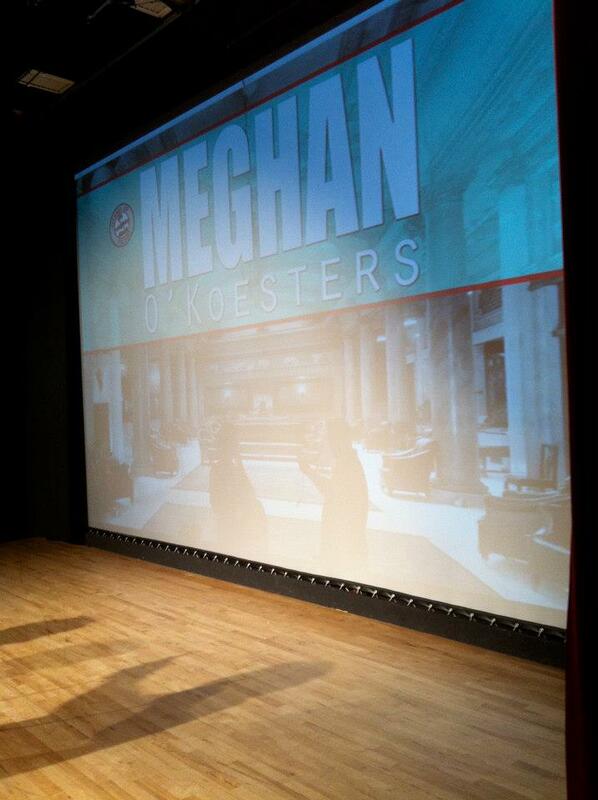 Okay, so Stand Up Toledo 2013 happened and it was a blast! I had a great time backstage with the comedians and we had a fantastic crowd. Toledo.com came out to cover the show and took some really sweet photos (some of which are featured on my comedian page). 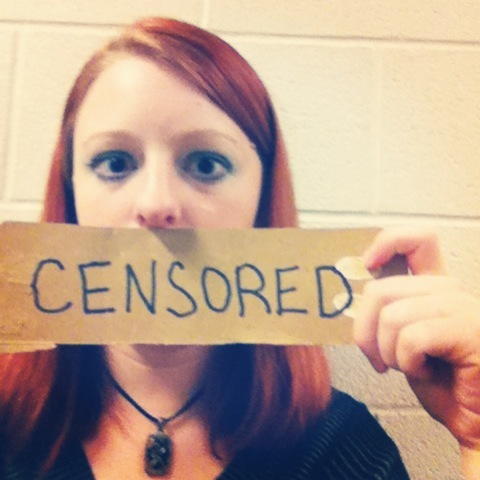 I took a few photos myself, but mostly I hung out with the camera people and comedians backstage, snuck out to watch some of the show, and ran around with a home-made “CENSORED” sign, censoring comedians and guests alike (for my own amusement, if not for the amusement of others). So the laughs will undoubtedly continue long into the month of February. Outside of comedy, I am receiving opportunities for work outside of my normal acting scope. I don’t want to go too much into it for privacy reasons, but I have an opportunity to audition for a full-time position as a children’s performer! There have been a few bumps in the road concerning this (mainly with sending information back and forth via snail mail), but I plan to do my best in spite of this and to give as good of a performance as I can, despite the shortened practice time due to the lack of luck with the postal service. There are also opportunities coming with my former school and their “Right to Read” week, as well as some fun with Already Indie (such as this video clip). And that’s that! At least for now, more updates to come as always (hopefully sooner next time around). 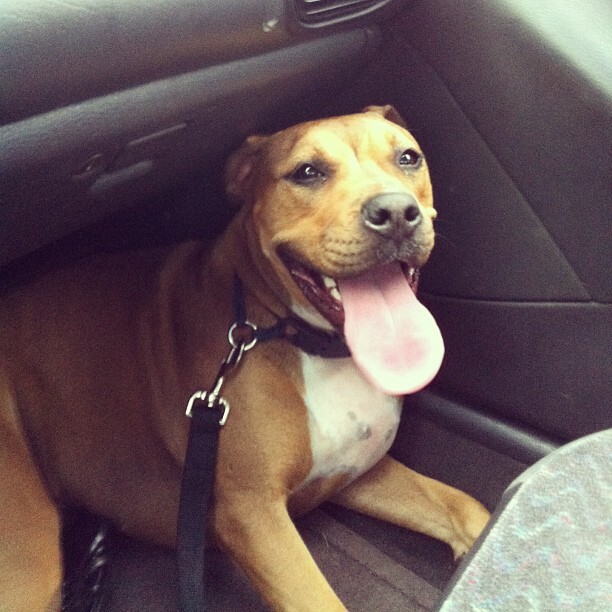 As always, thanks for reading and feel free to share this blog with your friends! I’ve never been one to make New Year resolutions. Not because I don’t think there is any merit to doing so, but because I don’t believe there needs to be a specific day in which to make a change in your life. I feel that if you want to make a change or break a bad habit you should do it immediately instead of waiting for the first of the year. That being said, there are some “resolutions” that I have been making in my life over the past month and ones that I need to start working on more. So, in the spirit of the new year, I’m going to write some of these out. Don’t worry, I’ll interweave some photos as well so you don’t get bored. In case you haven’t heard, I was one of five comedians voted to come back for a second time to perform at Stand Up Toledo! 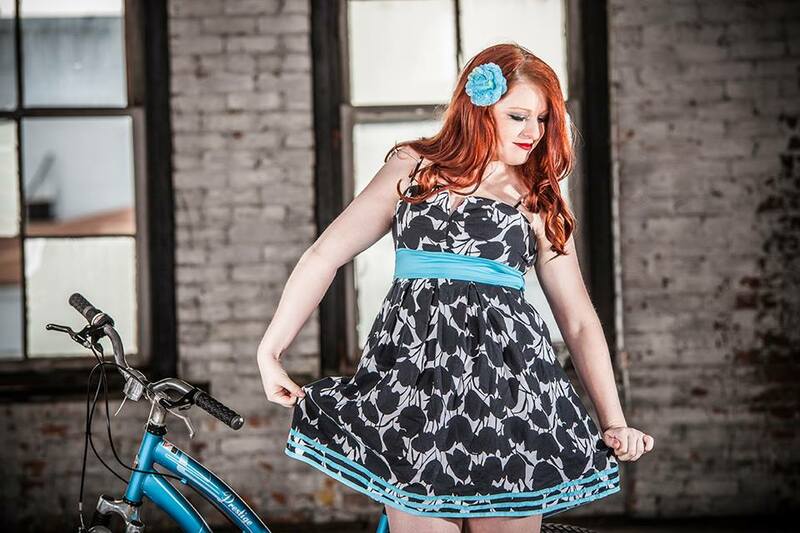 Stand Up Toledo is a showcase of 10 local comedians at the Maumee Indoor Theatre. I was one of the comedians back in 2012 and I had a great time! This year, I am hoping to improve and do even better than last year. Ideally, I would like to be able to perform all new material, but I think that there will be a couple repeats only because I have improved on a couple of the jokes that I have been telling for a while. If you buy your tickets from me, they are only $15, otherwise they are $20 at the door, which opens at 7pm on January 20th. 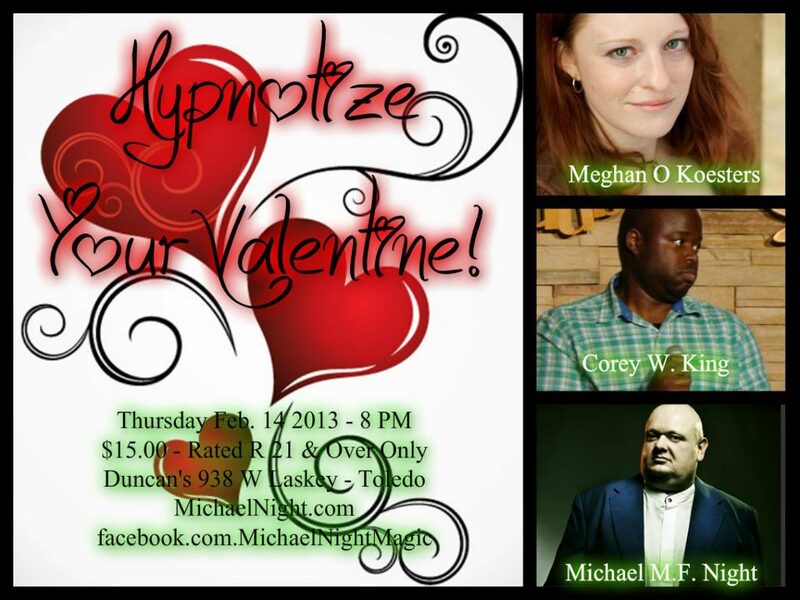 If you’re in the area, this is definitely a show you won’t want to miss! Along the same vein, I want to try to get as much stage time as possible and start doing comedy outside of the Toledo/BG area. I want to start acting way more than I am now. After all, it is what I want to make a career out of, but I’ve discovered that just having representation isn’t enough, at least not for me. 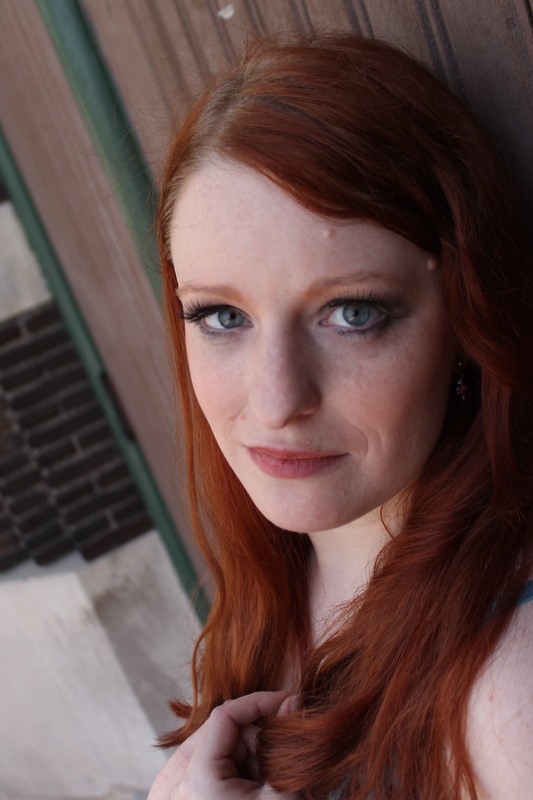 I appreciate the fact that I am being submitted for work, but thus far I haven’t been getting so much as an audition. So, rather than just giving up or waiting, I am taking a more active approach to my acting career. 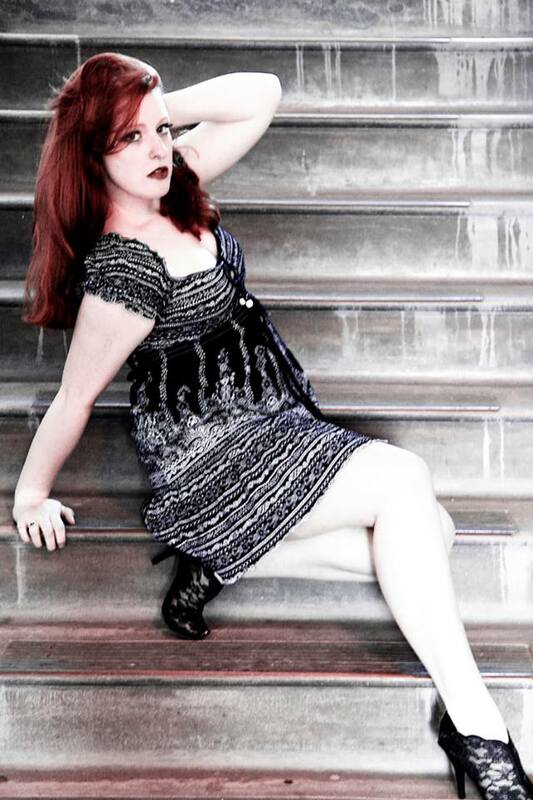 Thus far, I have submitted myself to multiple websites, casting calls, and have sent out countless emails to local casting calls, such as student films and local filmmakers. I want to get my face and resume out there as much as possible in hopes that the right person will see it and decide I’m worth a shot. Until I get cast, I plan on doing as much local theatre and film as I can and build up my résumé, as well as networking where ever I can. Sam wearing his reindeer costume. Naturally, I have other things that I am working on improving, but those are the top ones at the moment. I hope you enjoyed reading, or at least enjoyed the photos and I’ll be posting again soon. In the meantime, have a great start to 2013! 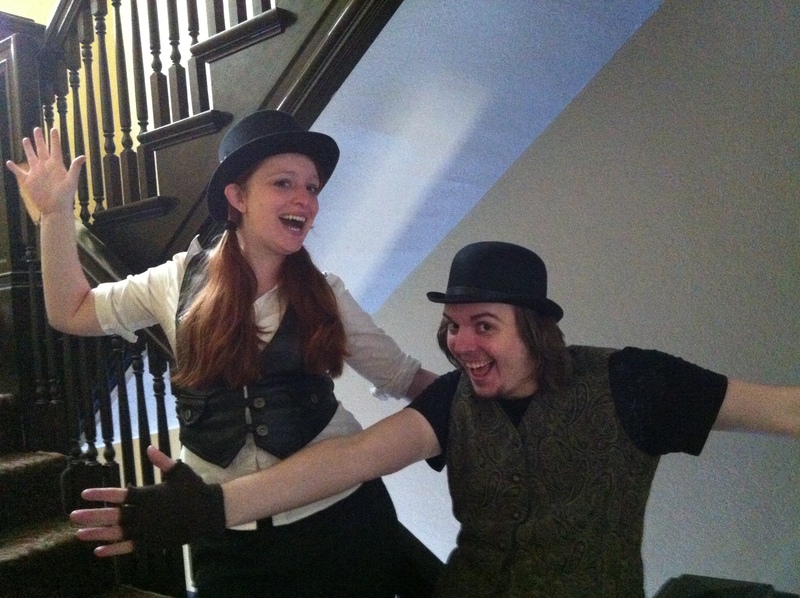 Back by popular demand, my steampunk series returns to feature Lionface Production‘s Dr. Faustus! 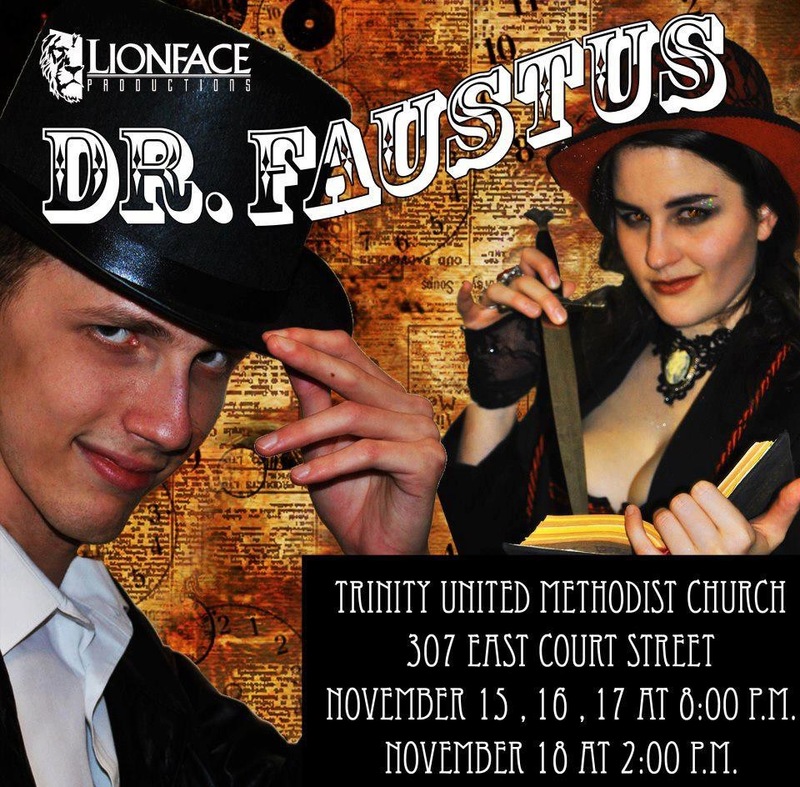 That’s right, for Lionface Production’s second show of the season, Christina Hoekstra directed a steampunk version of Christopher Marlowe’s Doctor Faustus. For those unfamiliar with this work, the story revolves around Dr. Faustus, an intelligent doctor who has become bored with the every day sciences and decides to try his hand at necromancy. He is guided by a Good and Bad Angel, each pulling him one way or another. He summons Mephistopheles and Lucifer, who agree to give him 24 years on earth with Mephistopheles as his personal servant. Faustus ultimately wastes this power doing nothing worthwhile and is ultimately damned to hell. In this version, the magic and power that Faustus receives is portrayed through steampunk. 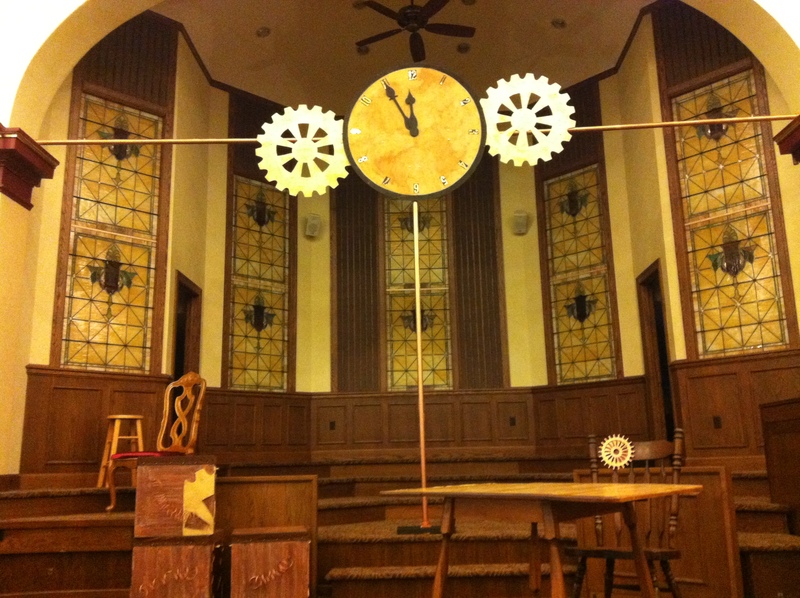 Emphasis was put on the various timepieces and clockwork in the show, symbolizing Faustus’s time running out. In this production, I played one of the scholars and the part of Robin the Clown, one of the comedic relief characters in the show. Our set was simple, yet very cool. We performed the show in a church, the same as when Lionface did Murder in the Cathedral, and the it ended up really working out in our favor. The set was designed and built by the very talented Meghan Johannes, who was able to pull it off on an incredibly small budget and still make it look super professional. One of the coolest set pieces were these blocks that Johannes made. I wish I would have gotten a better photo of them, because they were seriously boss. You can’t tell by this photo, but behind each block is a hole lined with what looks like a cog, so that props can actually be stored inside the blocks. 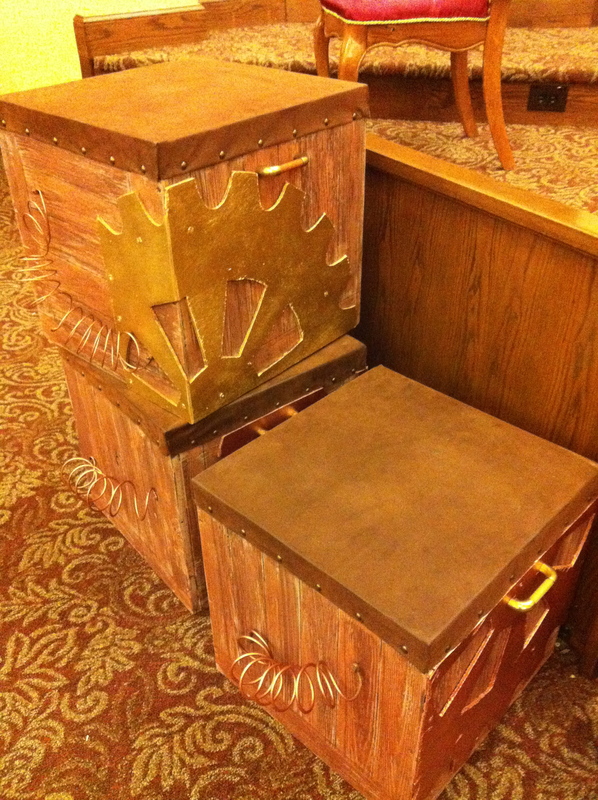 Each block also had handles, wooden gears painted gold and/or copper, and the copper wiring seen in this photo. One of the blocks was raffled off, but unfortunately I didn’t win one. 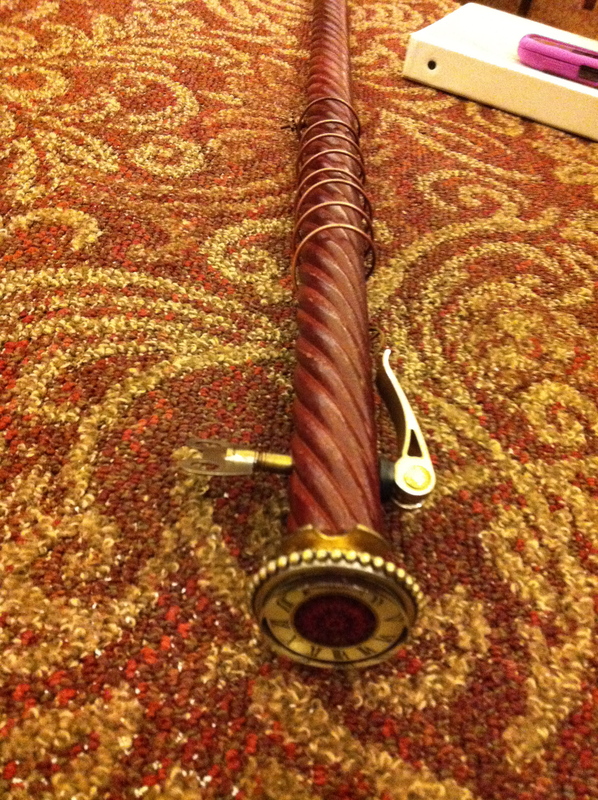 Another unique piece was Mephistopheles’ cane (also raffled off, also didn’t win, sad face) which featured a time piece as the hilt. Again, I wish I had a better photo, it was much cooler in person. It was tailored to be the length of the average cane and was able to be swung around without worrying about any pieces falling off (including the copper wiring you see towards the middle). 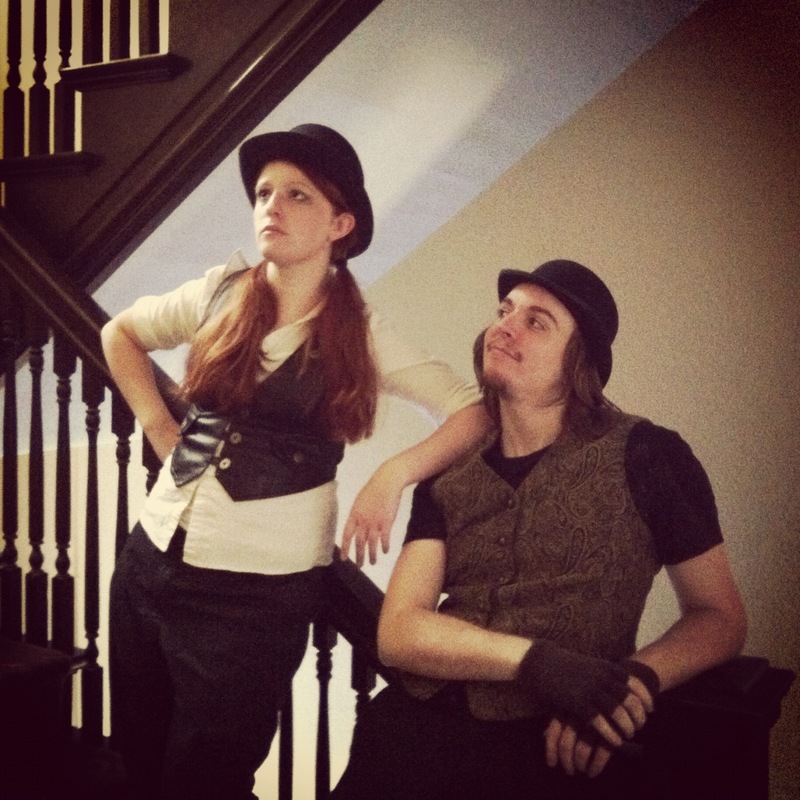 What could make a steampunk play even cooler than it already is? Throw in an awesome sword fight! To see a video of this check out my Facebook page. 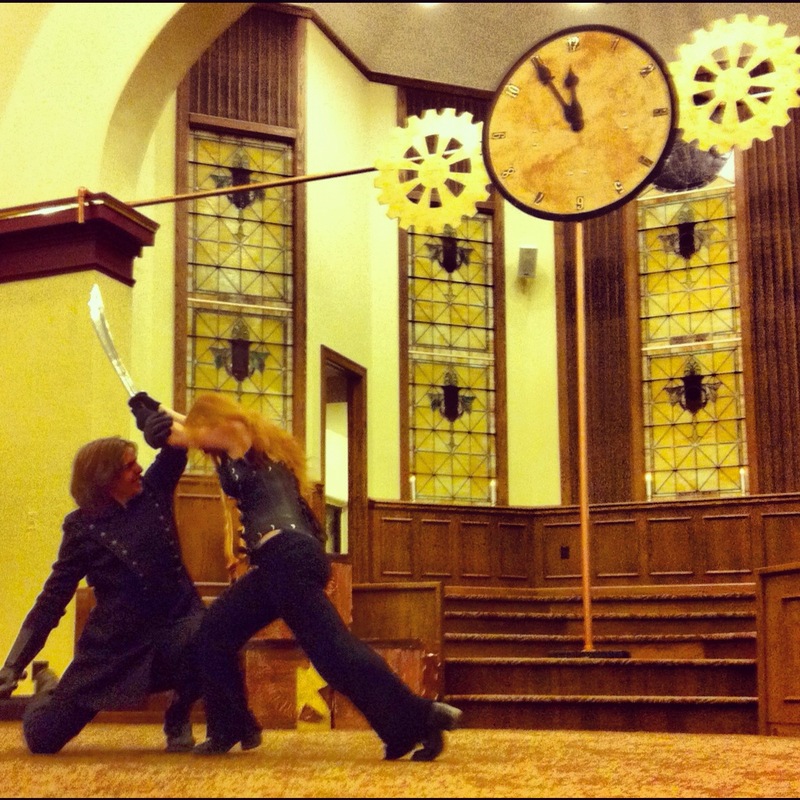 I wish I could say that was me doing the sword fight, but alas, it was another awesome ginger. And yes, those are in fact real swords being used, so it took a lot of stage combat choreography and practice to be able to pull it off without causing injury to one another. By the end of it, these two had the fight down so well that when one would make a mistake, the other would immediately adjust to make it safe again without having to stop the fight. Talent, plain and simple. And that’s it for my steampunk series! I may still post steampunk-esque photos now and then, especially since I’ve been getting more into jewelry making as of late, but this particular chapter of Halloween/Faustus steampunk is closed (at least until next year’s Halloween). In coming entries, I’ll be doing some updates on Stand Up Toledo 13, Already Indie, and the other happenings in my life. I hope you enjoyed reading! 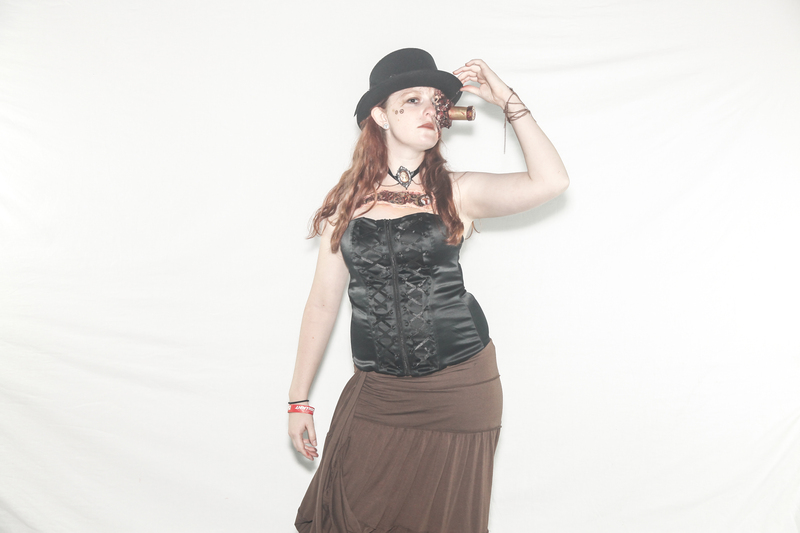 Hello again and welcome to the last installment of my steampunk Halloween costume series! In previous episodes/entries, I showed you how I made a prosthetic eye piece and several different accessories for the costume and now I will show you how I made a pretty sweet chest piece. I started with a thick layer of liquid latex in the shape of a sloppy triangle. I left the end of it curved for when I would add the clock piece. 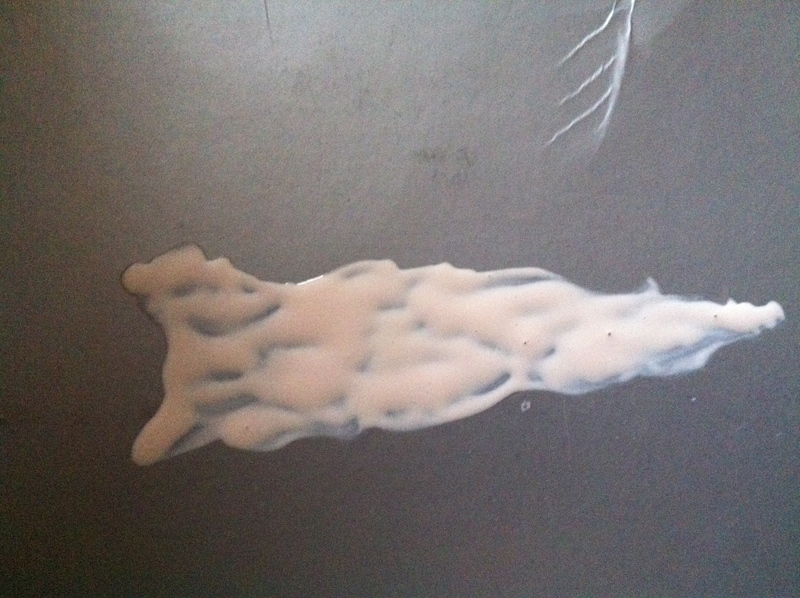 If you plan on doing this, you want to do it on a surface that the latex can be peeled off from, so a smooth surface that won’t have any chipped paint pieces or anything like that. I ended up using an old lid to a shoebox, which worked very well, especially if you want an easy cleanup and for your project to be portable while you are making it . After this layer dried, I added another one right on top of it so that the base would be thick and not fall apart when I added pieces to it. I added a third layer of liquid latex and began to add pieces. As you can see, some of the pieces got another layer of latex over parts of them to make it looks as though pieces of flesh were growing over them. It also gives the impression that there are more gears inside the body, behind the ones that you can see. 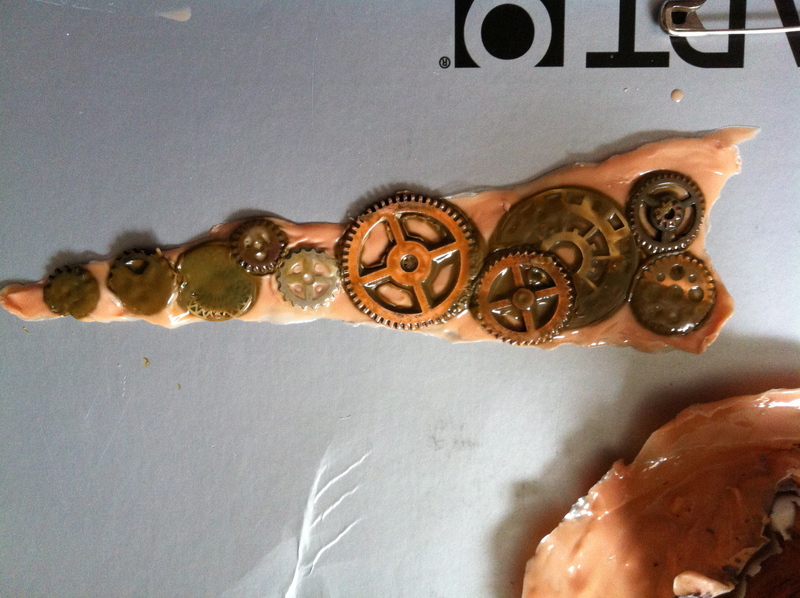 Interestingly enough, as the liquid latex dried, the colors from the gears actually caused the latex to change colors. So, naturally, I added another layer over it and some more gears to see if that would cover it up. The liquid latex continued to react to the gears even as I added more latex, so I ended up leaving it the way it was. In the long run, it actually worked in my as it looked as though the gears were having a reaction to my body and therefore leaking pus. Disgusting, yet very effective in what I was going for. Paint time! 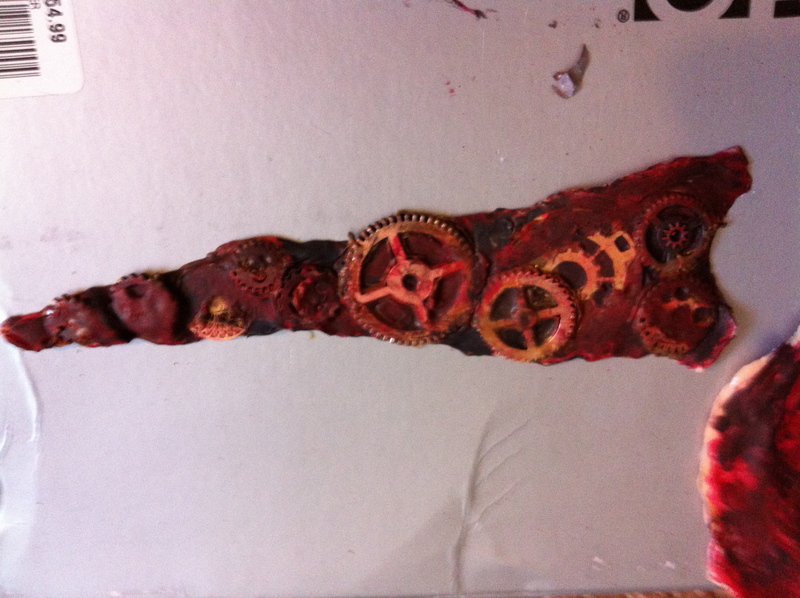 Using the same red and black acrylic paint that I used on the eye piece, I painted the latex around the gears and added some red on the gears to make them look as though they are covered in blood. 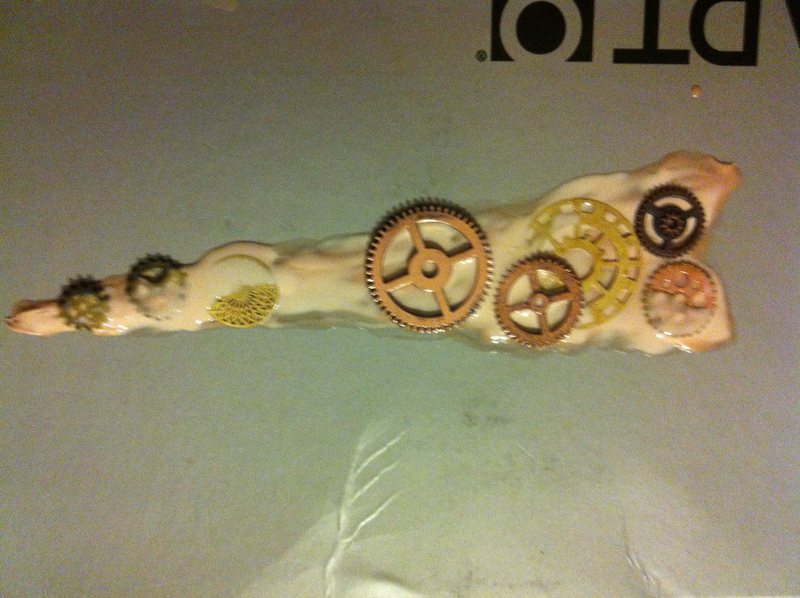 After the paint dried, I used a knife to cut away some of the latex so that you could see more of the gears and I cleaned up the paint on the gears so that they would still reflect off the light. Then, I used paint again to clean up the latex pieces that I had cut away from the prosthetic. This is actually the piece once I took it after wearing it. 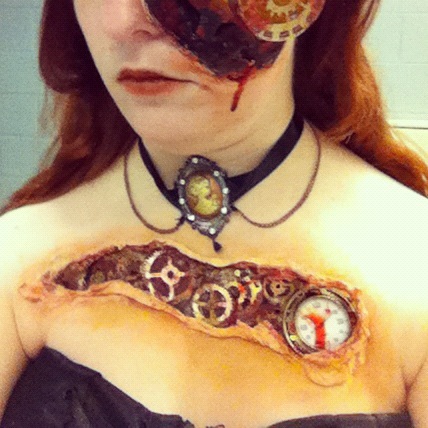 I attached the piece to my chest with spirit gum and then added the watch piece separately. 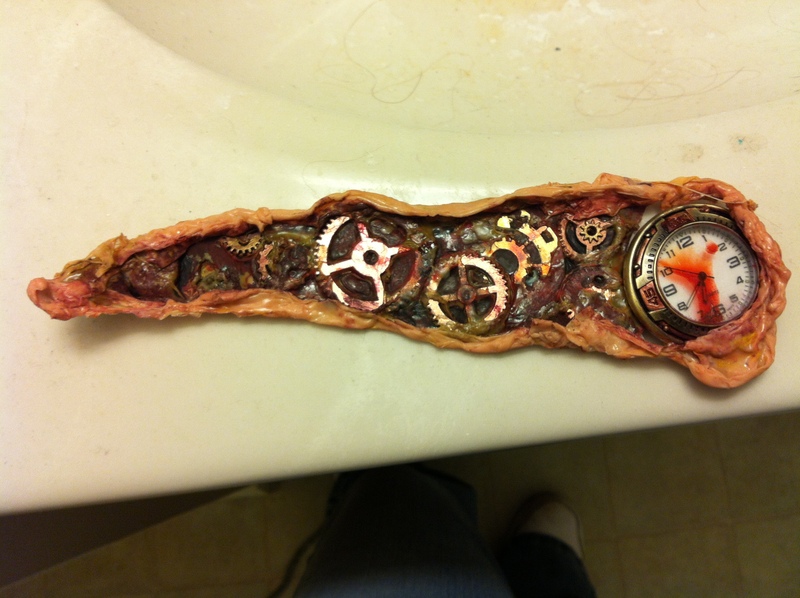 It was actually a watch piece that I had gotten from Wal-Mart and added copper paint to it in order to keep with my gold and copper color scheme. I also repainted over some of the gears to make them stand out, as the ones from Hobby Lobby were a bit darker and less shiny then the ones I had purchased at Costume Holiday House. Once I had the pieces applied, I made strips of latex about an inch wide and about 3-4 inches long on the shoebox lid. Once I had two layers dried, I peeled them off and added them to the top and bottom of my piece to give the effect that the skin was cut apart and hanging over. It also helped to make the wound look deeper and more three-dimensional. I made a few more inch by inch pieces of latex to fill in the spots that weren’t covered on the far side of the watch piece. After all of that, I used makeup to color the latex to my skin color and to make it look a bit more bloody and natural. I topped it off with some liquid fake blood, which gave it a glossy look and made the clock look as though blood was dripped on to it as well. Here’s what the piece looked like when it was applied. This also shows why I added the extra layers last, so that I could attach them to the skin as well as the wound and make everything look seamless. I had no trouble keeping the pieces on once the spirit gum had dried and actually had this piece on for most of the day. Now, I’d also like to point out that the watch piece is a working one and actually lit up with a blue light when you pressed a button (which was located near the number 2 and could be pressed despite the latex). Initially, I had considered using a bigger watch piece and trying to make it seem as though my heart was a clock, but I felt that this looked more realistic than that would have, so I adjusted accordingly. All in all, I was very happy about the way that this piece turned out and it will actually be featured again very soon in Lionface Production’s Dr. Faustus on the character of Mephistopheles. Pictures to come! Now we have come to the end of my series and now you know the story behind the creation of my steampunk costume. I may be doing an encore post as well in regards to Dr. Faustus, given that it is being done in a steampunk fashion, so stay tuned for that. In other news, I was voted one of the top five comedians from last years Stand Up Toledo, which means that I will be in it again this year! More information on that as it gets closer as well as some updates on Already Indie and life as an actress. Thanks for reading! With any great costume comes great accessories. Or at least decent ones. 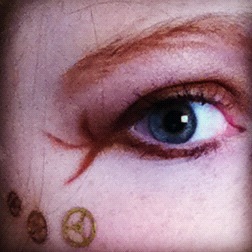 You can decide what you consider them after you see the ones that I did to accent my steampunk costume. All except for the awesome chest piece prosthetic, which will be my third and last installment of this series. So let’s get to it. In any makeup job I do, I try to accent the eyes the best I can. As you may have seen in my earlier entry, I had a large prosthetic eye piece, so I wanted to do something simple with the other eye as to not distract away from the piece. I went with a simple brown eyeliner color and flared out the corners a bit. However, the accessory part is the three golden gears that I spirit gummed along my cheekbone. Simple, but it ended up looking really cool. The next piece is the hat. It was just a simple, $5 black hat that I got from Spirit Halloween. The black, ribbon band was already attached to it when I bought it. I was unable to find any feathers that I liked, until I came across a pair of cheap, black feather earrings. 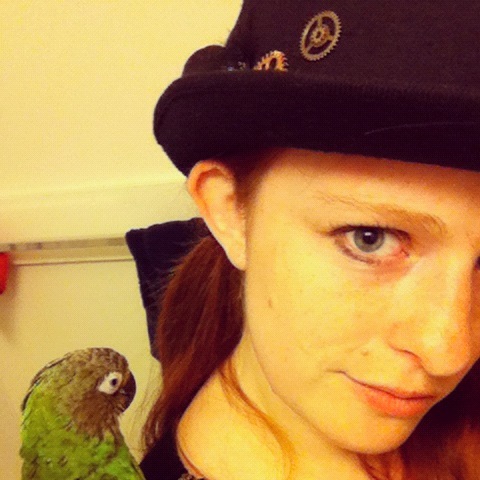 I took the earrings apart and, using craft glue, attached it to the hat. I then used some of the gears that I got from Costume Holiday House and one from the package of gears I got from Hobby Lobby, to complete it. 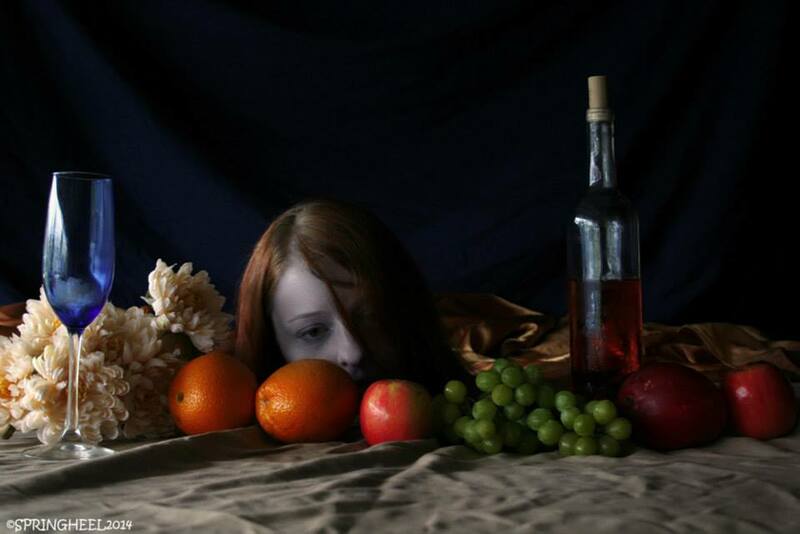 Again, nothing too fancy, but this particular piece actually captured the attention of my director for Dr. Faustus. 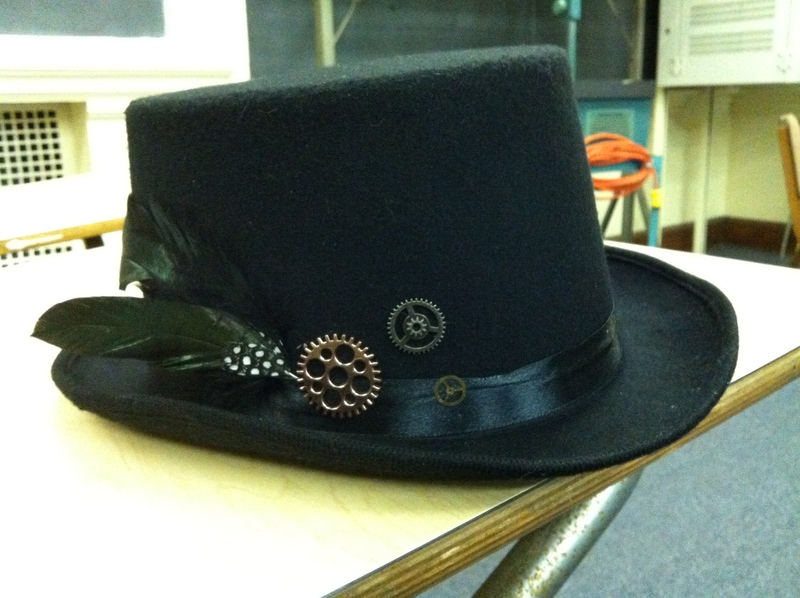 I will actually be wearing it as the part of Robin in the steampunk version of the show, put on by Lionface Productions. The next couple of pieces will also be featured in the show, but more on that in a later entry. Now we get into the more complicated accessories. 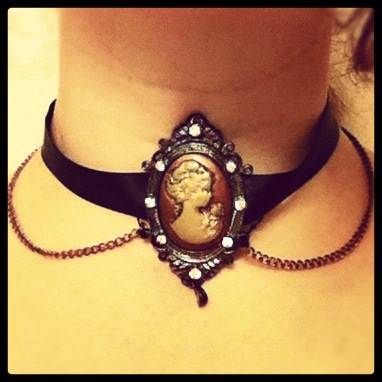 This choker started out as a blue and white Victorian portrait jewelry piece that I got from Wal-Mart. I started by repainting it so that it would match the copper and gold color scheme that I was going for. I then attached it to a piece of black ribbon using a mixture of black thread and craft glue. I had to sew it on to keep it attached and the craft glue to keep it in place. I then used some copper chain that I had gotten with jewelry piece and cut off two parts, which I sewed on. I added a clasp and loop to the back and accented it with a couple of gears where it clasped at so that the back was decorated as well. 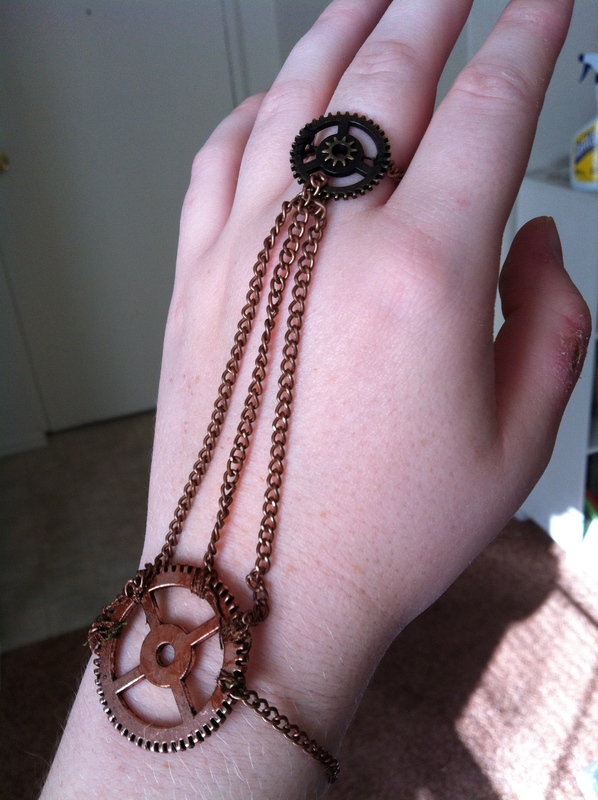 Finally, I created a handflower out of some of the remaining chain and gears (again, one from each package). This was a little more tricky to make. The ring part is fit to my size and is made from the chain, which wraps around my middle finger and connects at the gear. I then made the wrist part using one of the large gears and doing basically the same as the ring, only this time I split the chain and attached it with a clasp. I then measured out three lengths of chain which I used to attach the two pieces together. I used ordinary black and brown thread to attach all the pieces, and then used a layer of copper paint to help lay down the stray pieces and make it look more metallic. It took me a couple of hours to get it the way I liked it, but out of all the pieces that I made this is probably the most impressive. And that pretty much covers it for the accessories. As stated before, my last installment is how I made the chest piece and put everything together. Thanks for reading!